Speaking to my grandmother about her long journey from Saigon to Paris in 1955, we were in agreement about how much things have changed today and how much some remain the same. Even in economy class, we passengers expect pampering. We expect a range of services including in flight entertainment, reclining seats, cushioned fixtures, foot rests, games and more. These would have been nonexistent in 1955. Beyond airline perks, we now have access to fast jet aircrafts which we take for granted. Eager passengers can gain their destination rapidly, often without needing to stop for refuelling. For example, today, Air France flies directly from Paris to Hanoi. Nonstop. Prior to 2004, this route included 1 stop in Bangkok. And what about in 1955? How many stops? This is the story of an Air France flight from Saigon to Paris. It was in May 1955. It isn't just a flight. It's a journey through one's social fears, about encountering deep set prejudices, learning about one's self-delusions and about miscommunication. It's a journey that emphasises human strength, endurance and hope. It was decided. Due to the difficulties with remaining in Vietnam, Phuong Lan was to leave her homeland and settle in Paris. Her French husband, Yves, who had some business to settle, would join her later. My grandmother, who had never set foot outside Indochina and was very reluctant to leave Vietnam would fly all the way to a country she had never seen. Alone. Well, not quite alone. During this pioneering journey which most people of her generation living in other parts of the world would never experience, Phuong Lan would have to be responsible for her 4 children: my mother, then 6, my uncle aged 4, an aunt barely a toddler...and if that was not enough, there was my other aunt, still a 2 months old baby. While not comparable to the perilous boat journeys undertaken by some immigrants, Phuong Lan's long flight would be marked by intense fear, exhaustion, nervous anticipation of what lay ahead, a sense of social isolation and a heightened sense of despair and hopelessness. The journey was a nightmare. A total of 36 hours. Today it would take a mere 12 hours to fly from Hanoi to Paris. But in her flight to Paris, my grandmother counted 5 stops. For each stop, all passengers had to disembark by the stairs and walk across to the local airport. There were no airconditioned gates or satellites , as they are called in Paris. For each stop, my grandmother held her baby tightly in her arms. Then she carefully descended the narrow steps to the tarmac while trying as much as she could to keep her other 3 children well behaved and close to her. During these stressful stops, Phuong Lan felt uneasy and helpless. I've often seen women hop on a train carrying heavy bags and frantically managing their pram. In most cases, I find these women receive careful attention from other train passengers, especially as they disembark or move their pram about. But this was not the case for Phuong Lan. Most of the other passengers were French and she recalled that none of the hostesses or passengers offered to help her as she struggled with her children. Considering that it was 1955 and the French had been at war with Vietnam, I find it easy to imagine that she would have been eyed with disdain while her Eurasian children were examined with curiosity or even outrage. Even if there were no prejudices at play, I believe that enough social conformity was active among those present to limit anyone from standing out in the crowd in order to help her. Air hostesses included. After taking off in Saigon, the plane stopped in Bangkok, Karachi, Beirut, Istanbul and Frankfurt before finally reaching Paris. Out of all the airports, it was the one in Beirut that most impressed Phuong Lan. Twenty years before war broke out in Lebanon. Newly independent Lebanon was thriving. 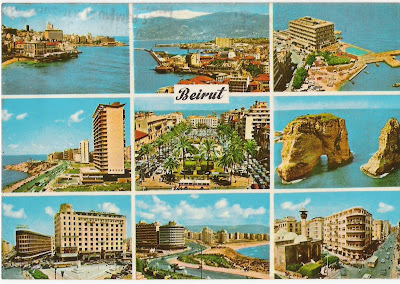 It was the golden age, a period of architectural grandeur and in those days, Beirut was the Paris of the Middle East. Sadly, I will never be able to capture what my grandmother saw when she entered Beirut's International Airport. So I have included a postcard which one of her friends sent in 1972, 3 years before war broke out. My grandmother sighs and says that the Beirut airport was "magnificent". It was clean, resort like and so unlike the grim, functional appearance of other airports that she had so far seen. Phuong Lan had heard of Lebanon, previously a French mandate, but her knowledge was limited and she had never met Lebanese people. It was the locals' appearance that surprised her the most. Like many people, my grandmother did not discern well between foreigners. She imagined Lebanese people to be identical to Arab people. She expected to see that everyone would be dark skinned with black hair and eyes. I'm sure this stereotype still exists today in some parts of the world! She says that she was amazed at how inaccurate her expectations of Lebanese people was. First of all, it is true that some had dark features. But in some cases their complexion was whiter than her own. It surprised her. And then some of them had blue eyes! Others had green eyes! She was amused to find her stereotypes shattered. She tells me that on the whole, in her opinion, they were such beautiful people with such pleasant features. And most of all, they gave her the kindness she needed. This is what happened. Half way through her exhausting journey which threatened never to end, Phuong Lan was at her wits end. My baby auntie would not cease crying. So my grandmother stopped in a cafe and bought breakfast for her children. There she asked for some boiled water so that she could mix it with baby powder and feed the baby. The waiter at the cafe was a young blond man with blue eyes, wearing a neat bow tie. My grandmother describes him as exceptionally handsome (she remembers!) He kindly filled the baby bottle with boiled water and brought it to her. But when the waiter had gone, she accidentally dropped the glass bottle to the floor where it broke into pieces. It wasn't much. But it was enough. At this moment, Phuong Lan's helplessness got the better of her. She lost the self-preservation that she had so far maintained. Seeing the disaster on the floor and hearing her baby cry, she could no longer suppress the emotions that had been simmering since Saigon. Poor thing, she began crying uncontrollably. Right there, on her seat, in the middle of the cafe while her children stared at her in distress, not knowing what to do. She cried because she was tired. She cried because she felt alone and ostracised. She cried because she was a stranger, stuck in an unknown place, heading to yet another unknown place that she imagined would be rampant with more staring, more unhelpful French people. She felt terrible. She cried... comme une madeleine, as we say in French. It was then that the highly empathic waiter came to her rescue. He seemed to understand her despair and rushed to her seat to assist. She remembers that he kept saying in soothing voice, in French: "Please don't cry, please don't cry. I'm going to get you another bottle of water. Please don't cry." After her long ordeal and her gnawing anxieties, my grandmother craved human care. Finally she had found it. This young man was especially considerate. He managed to calm her down and to at least equip her emotionally for the rest of her journey. It is no wonder that she remembers him today. The effect was immediate. As she stepped down nervously onto French soil, Phuong Lan's jaw dropped. She was crushed. "Is that it?" she kept repeating to herself. "Is THIS Paris???" She couldn't believe it. How she missed the green lushness of Vietnam, its trees, its flowers, its heat. This was Paris? What an absolute dump, she thought. She kept her contention to herself but in those earlier days in France, her surroundings filled her with depression. Her parents in law and sister in law, all of whom she had never met, had driven to the airport. They greeted her and led her and the children to the car. My grandmother felt very cold. I forgot to mention that she had completed the entire journey in Vietnamese traditional dress. How chilly it must have been for her as she arrived in her silk áo dài, her loose pants and sandals. Once seated inside the car, she encountered another hurdle that again tested her nerves. My great grandfather was trying frantically to warm up and start the car but the engine was taking a while to respond. So he waited and began mumbling to himself. Meanwhile, the baby was crying again and Phuong Lan was beginning to feel embarrassed. Addressing herself to the infant, she cried: "What's wrong?" My great grandfather thought that she was talking to him and that she was becoming impatient. Though a kind man, he had lived in the country for all his life. So he brusquely turned around and muttered: "What's wrong? It's that the damn car won't start, that's what's wrong." He didn't mean any harm but Phuong Lan was not accustomed to being spoken to in this tone. So she burst into tears. And this was only the beginning of her life in France. Today, cross-cultural interactions are somewhat a little smoother. Or are they?